Check out this short preview from Dara and Marc’s spectacular wedding day. The National Museum of American Jewish History has an amazing story to tell, and it was quite a scene for Dara and Marc’s wedding celebration. Don’t miss the exciting moments of wedding preparation, as our bride and groom get ready to tie the knot. Dara’s beautiful smile is a tell-tale sign of her love for Marc. EBE Entertainment-Monte Carlo had no problem keeping the guests on their feet as the evening carried on. The Allure Films team was happy to be a part of such a wonderful wedding. Congrats Dara and Marc, and thank you for allowing us to capture your day! What a pleasure it was to be included in Jillian and James’s wedding celebration. With heartfelt words and beautiful moments, this preview will certainly bring a smile to your face. The breathtaking landscapes and waterfalls at Rivercrest Golf Club provided quite a stunning backdrop for our lovely bride and groom. Jillian and James shared so many fun-filled and loving memories with their family and friends. Gerard Tomko Photography was there documenting each moment as it unfolded. 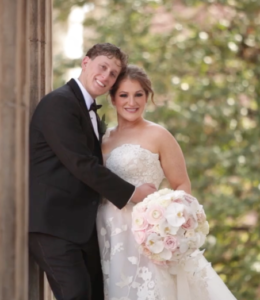 Congratulations Jillian and James, from the entire Allure team. Thanks for letting us in on all the wedding day magic. What a blast! We are always thrilled to be a part of any Hesse celebrations. This family sure knows how to party. Join Charlie, Larry, and all their family and friends as they celebrate their high school graduation. Mermaids, hula dancers, fire-eating, a giant water slide, mechanical shark…this party had it all! Enjoy this short preview we put together from this incredible party. Congrats Charlie and Larry, from all of us at Allure!